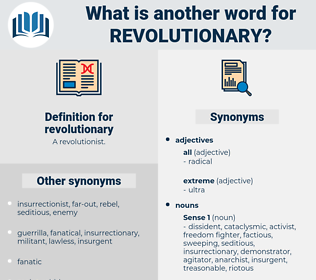 What is another word for revolutionary? disruptive, rebel, innovative, leftist, ultimate. obedient, temperate, middle-of-the-road, true, loyal, steadfast, true-blue, tractable, submissive, staunch, compliant, liberal, devoted, constant, progressive. A ring of fire and flame and hate was drawn about the great revolutionary city. Fifty years ago, my old master's political opinions were considered to be nothing less than revolutionary. 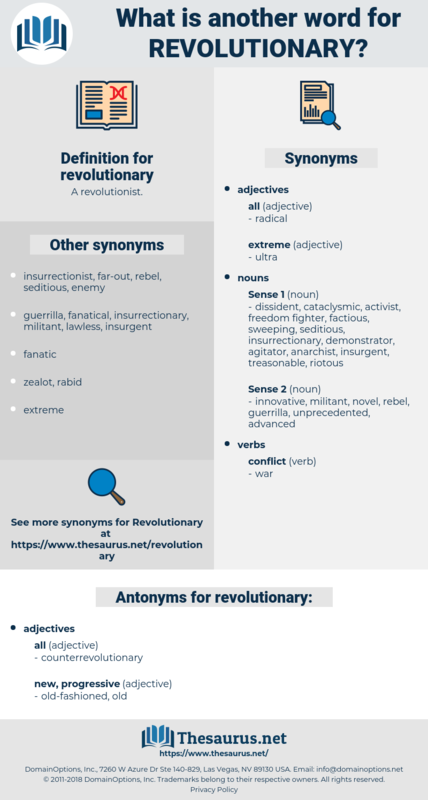 freedom fighter, counter-revolutionist, counterrevolutionist, insurrectionist, dynamiter, girondist, girondin, rebel, counterrevolutionary, insurgent, dynamitist.